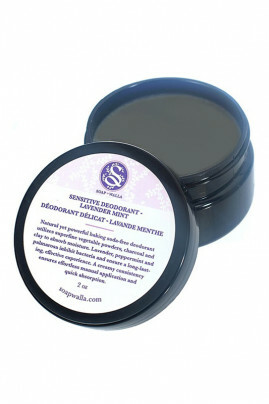 Also available in lavander and mint fragrance with Soapwalla's LAVENDER & MINT Deodorant for Sensitive Skin ! SOAP WALLA Vegan for Sensitive Skin with Mint & Lavender neutralizes unpleasant odours ! Gently stir deodorant thouroughly with a finger or spoon prior to use to ensure deodorant is well mixed (some separation is normal), scoop a small amount of Soap Walla Deodorant with your finger and gently apply to the entire armpit. Allow cream to absorb completely, then go about your day stink-free ! The grey colour of vegetal carbon disappears after application, leaving an invisible powdery finish. If you have sensitive skin, make a test on a small area inside your wrist 2 to 3 days prior to using, in order to detect any allergic reactions to essential oil or clay. If it happens, space out the uses like every other day. A 100% natural composition in SOAP WALLA Sensitive Skin Deo Cream !